I stayed at the Hilton Resort at Walt Disney World March 9-10. In truth, I was expecting to be disappointed by my stay at the Hilton -- I'd just cruised on the beautifully-appointed Disney Wonder. 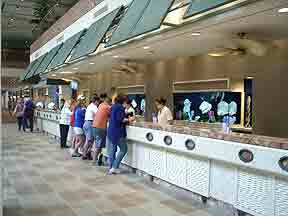 Besides, I tend to be a bit of a Disney resort "snob," preferring to stay only at Disney resort hotels. 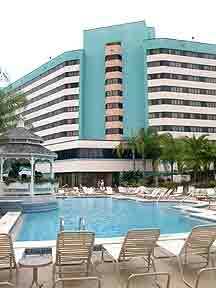 Instead, I was delighted by the Hilton, my room, the pool area, and the transportation! I stayed just one night, but I would have been happy to extend my stay. So for those of you out there wondering if this on-property, non-Disney resort is worth it, my answer is a resounding YES! I was looking for an inexpensive yet upscale hotel for the last night of my vacation. 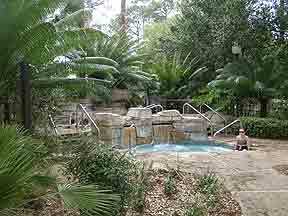 So I used Priceline to bid on a resort hotel near Walt Disney World (see our article on Priceline at http://www.passporter.com/articles/priceline.htm). My bid of $71/night was accepted by the Hilton -- a great price! I hear that some vacationers have successfully bid on the Hilton at rates as low as $60/night. Do note, however, that Priceline charges a $6/room processing fee and the Hilton has local taxes of 11%/night. If you're not comfortable using Priceline, rack rates start at $189/night in the off-season, but we've seen rates on Expedia.com and Travelocity.com as low as $170/night, and rates on Orbitz.com as low as $116/night. The first thing you'll notice about the Hilton is how close it is to Downtown Disneyyou can see it when you pull up to the resort, and the Downtown Disney Marketplace entrance is just a five-minute walk away. The 10-story hotel is set on 23 nicely landscaped acres. 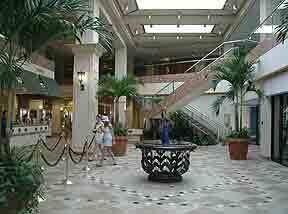 The pink-and-aqua exterior is unassuming, but the marble-floored lobby is large and well-appointed. 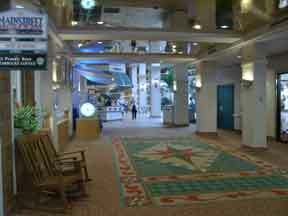 While there is no theme at this resort (unless you consider "upscale business tropical" to be a theme), the hotel is tastefully and even playfully decorated. 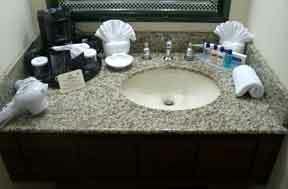 Check-in went very smoothly, and I felt no less welcome because I'd received that great Priceline rate. I was asked if I wanted to use the fitness center for $8/day. I declined. A note in my check-in booklet also informed me that the in-room safe would cost $4/day if I wanted to use it. 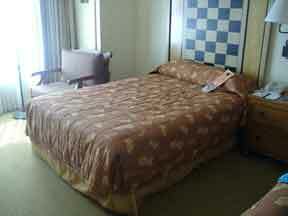 Of the 814 rooms in the Hilton, I stayed in room 601 -- a standard, non-smoking room with two double beds. In addition to the two beds, the room boasted a work desk with a two-line phone, a comfy chair, an armoire with TV and minibar, a large closet with organizer shelves, hanging rods, iron, ironing board, a safe, and a marble-topped vanity outside the moderately-sized bathroom. On the sink was a hairdryer, coffeemaker with a complimentary bag of coffee and Neutrogena toiletries (shampoo, condition, lotion, mouthwash, face soap, bath soap, and a shower cap). 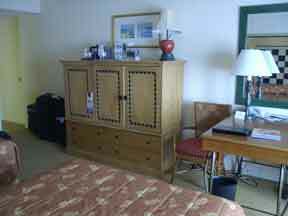 The room was fresh and clean, the beds were comfy, and the decor was subtly tropical. The room felt quite luxurious. I understand that the hotel's room were renovated from 1998-2002, and this room clearly felt up-to-date. All of the hotel's rooms are accessed by interior hallways, but none appear to have balconies. Our room did have a large window overlooking Interstate 4, but north- and west-facing rooms on the 6th-10th floors have a view of Downtown Disney, with Magic Kingdom visible in the distance. 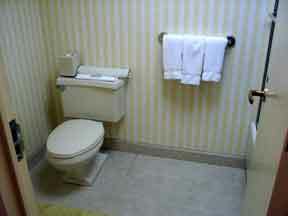 The hotel also has 200 rooms with king-size beds, and 48 rooms in the hotel are handicapped-accessible. There are also specialty guest rooms, such as the upgraded Hilton HHonors rooms (with business features), alcove rooms with sitting areas, Japanese guest rooms (with tea, robes, slippers, and Japanese newspapers), suites, and concierge tower rooms. 1. Extra Magic Hour perk (to get into a theme park an hour early on a given day) -- the Hilton is the only non-Disney hotel (other than Swan and Dolphin) to offer this perk. 2. Disney character breakfast every Sunday morning. 3. Free bus transportation to the theme parks, water parks, and even Downtown Disney (more on that next). 4. 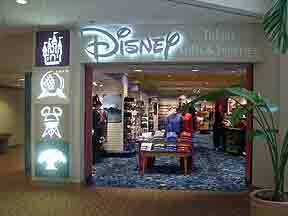 A Disney gift shop in the lobby. Free buses are available to the theme parks, water parks, and Downtown Disney. A sheltered bus stop is in the rear of the resort, just past the Avis rental car desk. The buses pick up every half hour, starting one hour before park opening to two hours past park closing. I noticed for separate buses, one each for Magic Kingdom, Disney's Animal Kingdom, Downtown Disney, and Epcot/Disney-MGM Studios (which shared a route). Unlike the Disney buses used at the Disney resorts, these are like traditional touring buses, and hence more comfortable. Onboard monitors display advertisements for nearby attractions, as well as information on the hotel's perks. It was here that I learned about the "Downtown Disney Resort Area Hotel Passport" which supposedly had information and coupons in it (more on that later). The transporation was efficient, though we did have to wait for the bus driver to take a break between Epcot and Disney-MGM Studios -- we waited on the bus for about 15 minutes. You should receive a "Downtown Disney Resort Area Hotels" coupon booklet when you check-in, but if you do not, request one. Coupons in the 2003 booklet included Pleasure Island (20% off admission), Finn's Grill at the Hilton (50% off second entree), Richard Petty Driving Experience (10% off), MurderWatch Mystery Theatre ($5 off), Wyndham Palace (10% off spa service and drink discounts in the lounge), Medieval Times (10% off admission), Grosvenor Resort character breakfast, Cirque du Soleil (savings on souvenir packs), etc. The savings on Pleasure Island alone can be a big help! I didn't have time for much more than a quick lunch from the deli, but I did notice that there were a LOT of dining choices. Benihana is a Japanese teppenyaki steakhouse and sushi bar open from 2:00-10:00 pm. Finn's Grill offers steak and seafood from 5:30-11:00 pm. Covington Mill Restaurant is a family restaurant open for breakfast and lunch from 6:00 am-3:00 pm, with a character breakfast every Sunday from 8:00-11:00 am. 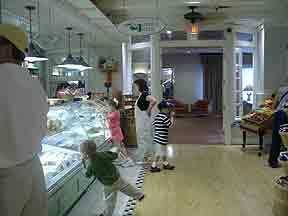 Mainstreet Market is a 24-hour deli with sandwiches, ice cream, and convenience items (sodas, cookies, snacks, etc.). John T's is a sports bar with cocktails and appetizers, open from 3:00 pm to Midnight. Mugs is a wine bar and coffeehouse serving Starbucks coffee. Rum Largo is the pool bar/cafe with pizza, salads, and sandwiches (open as weather permits). The room service menu is extensive. And let's not forget all the restaurants at nearby Downtown Disney, too! with lots of fresh food. All in all, I highly recommend this resort... especially if you can get a room here for under $100. It's a great, upscale alternative to Disney's value and moderate resorts, and you can't beat it's proximity to Downtown Disney. And when you add in the transportation, character breakfast, Extra Magic Hour, and Disney gift shop, you've got something very similiar to a Disney resort hotel. The large hot tubs in a "grotto" at the Hilton.